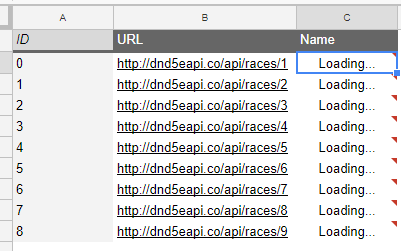 I am working on a side project, the goal is to use Google Sheets alongside existing microservices to generate a comprehensive Dungeons and Dragons Fifth Edition spreadsheet. It's more of a labor of love than anything. Criticism very welcome. I am learning a lot about how information is represented in Google Sheets, and have found it relatively lacking in comparison to Microsoft Excel, until I learned about how data could be transformed using Pivot Tables. Generally, I have an idea about how I will represent my data, I place just enough information in spreadsheet rows and columns to perform my query, and then I would like to retrieve my data from the API endpoint using a pivot table to construct the query url, and parse the JSON into the table from there. When using the IMPORTJSON custom function inside of a spreadsheet, the query works fine, returning the rows of data that I would normally come to expect from the jsonpath-ish string that I pass into the function. However, when using the IMPORTJSON function in the formula for a value, the pivot table is just stuck with "Loading" and "Error: Loading Data..." forever. MY true source of confusion is that the IMPORTJSON function works for spreadsheets, I have not have had a single issue with it using it to populate a spreadsheet, the only time I have an issue with it is when I try to populate a Pivot Table Value using the IMPORTJSON function as the formula. If it works in one place, it should work in the other in theory, right? Custom function doesn't work on features like Pivot Table, conditional formatting, etc. They work only when applied directly as cell formulas. The workaround is to add an auxiliary column on the Pivot Table source data and extend the reference accordingly but it's highly recommend to optimize IMPORTJASON first in order to avoid having to repeat this custom function several times on the spreadsheet to avoid performance issues. Can I use custom function in the 'custom formula is:' field? Not the answer you're looking for? Browse other questions tagged google-sheets google-sheets-custom-function pivot-table json or ask your own question.